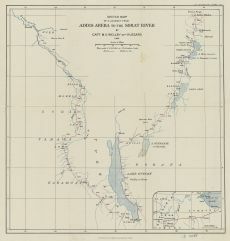 Sub-Title: Sketch Map of a Journey from Addis Abeba to the Sobat River by Capt. M. S. Wellby 18th Hussars 1899. Notes: Associated with Book ID 2444. Published in "The Geographical Journal, 1900" by the Royal Geographical Society. On the lower right corner, inside the neat line: inset with an overview of the depicted region.